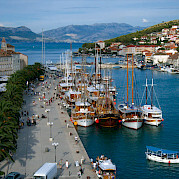 Discover the joy of a Croatia Bike & Boat tour on the gorgeous azure-blue waters of the Adriatic! 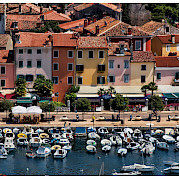 Croatia has well-kept coasts with 1,185 islands, and endless reefs and bays. 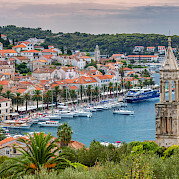 These natural wonders make cycling Croatia an unforgettable experience. 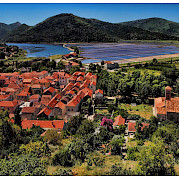 Roman ruins abound and old stone buildings give the country a certain medieval flair. 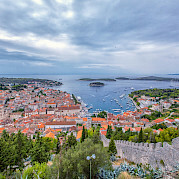 Besides being stunningly beautiful, bike tours in Croatia give you one unique view into a different slice of European history. 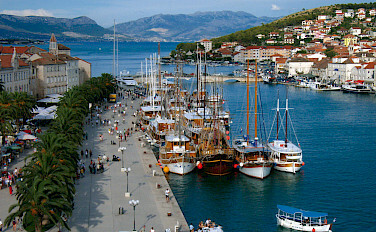 Croatia is known for its great seafood and for being much cheaper than its European neighbors. 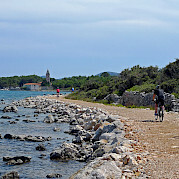 With the availability of e-bikes, you can now bike Croatia without worrying about conquering the many hills. The breathtaking vistas are accessible to everyone! You will not regret biking this amazing country. Kapetan Jure Croatia Comfort Class Boat Captain Anton and his crew form an experienced and friendly team, who know how to pamper their guests with delicious specialities. 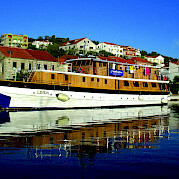 With its 15 cabins, the Kapetan Jure offers place for 30 guests. 11 of the cabins are on deck. 10 of these are furnished with 2 beds arranged side by side, while one cabin has bunk beds.The remaining 4 cabins are below deck and are furnished with a French bed (140 cm wide). 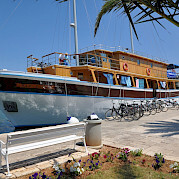 Linda Croatia Comfort Class Boat The ship is a spacious wooden motor yacht and with 31 meters long and 6 meters wide, the MS Linda is among the bigger ships in the Croation fleet. The large saloon can accommodate 32 guests and the middle sundeck is constructed in a way that allows for outdoor dining. Romantica Croatia Premium Class Boat Captain Jure's Romantica, our brandnew ship in Croatia, was launched in May 2007. 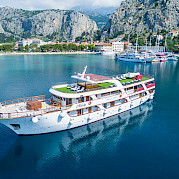 The ship is 32 m long and 7.6 m wide and possesses solid structural steelwork which, as the name says, connects romance with modern design and functionality. Princess Diana Croatia Deluxe Class Boat At 40 x 8.5m the Princess Diana is a 3-masted deluxe class motor yacht that was launched in 2011. 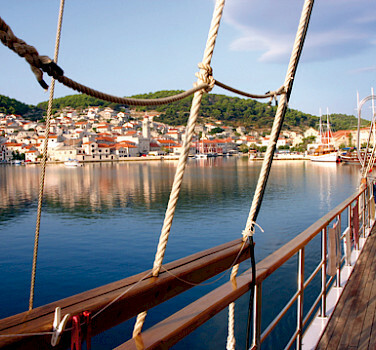 This ship is the princess of the Croatian fleet, an epitome of pure elegance. 16 spacious guest cabins with air conditioning, shower cabins and WC are at your disposal. The spacious salon as well as the canopied deck, with upholstered seating, are situated on the top deck. You’re invited to play music on the piano and to relax to your heart's content. You will find sun mats and deckchairs on deck. The jacuzzi on the top deck is a highlight with its 360° panoramic view. Andela Lora Croatia Deluxe Class Boat At 40 x 8.5 m the motor yacht Anđela Lora was launched in June 2012 and is an elegant addition to our comfort plus category. 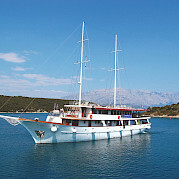 She is one of the biggest boats of the Croatian fleet with 17 spacious guest cabins – plenty of them available as three or four bed cabins – with air conditioning, shower cabins and WC. A bathing platform is available at the stern offering easy access into the sea. For a special experience, a salt water pool and numerous sun mats are available on the sundeck. The friendly crew will always make sure that you enjoy a recuperative stay on board. 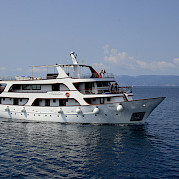 Harmonia Croatia Deluxe Class Boat At 38 x 8.3 m the MY Harmonia is an elegant, pearly-white motor yacht. This two masted beauty meets the highest expectations with 16 luxurious guest cabins including tiled bathrooms with shower cabins/WC. The salon and numerous sun mats and beds on deck are at the guest’s disposal. 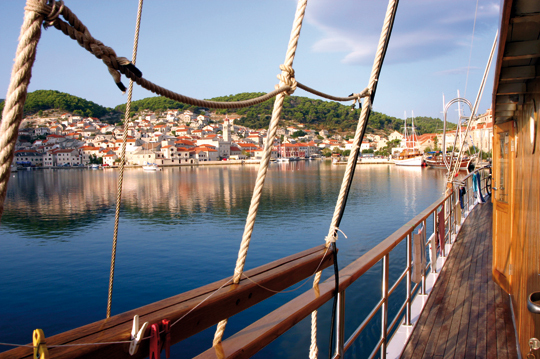 With the bathing platform at the stern, taking a dip in the sea is accessible and unrestricted! The experienced crew and the captain are waiting to welcome you on board! Melody Croatia Deluxe Class Boat Built in 2014/2015, the 42 m long and 8,30 m wide Melody is a floating deluxe hotel, crafted for excellence. The exquisite décor and elegant form conjure a regenerative atmosphere for the comfort of small groups of up to 31 people. 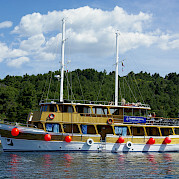 The 15 capacious guest cabins are characterized by a high-class interior with air conditioning, private baths, and safe. Relaxation is limitless on the spacious sundeck, in the wellness room or in the jacuzzi on the top deck. Eight crew members are registered under captain Pave to cater for the wellbeing of the passengers on board.